This is the third book in the Daughters of Mannerling series and so far the best one. The first book was The Banishment and the second The Intrigue. In this installment, the focus is on Abigail Beverley. The two eldest sisters have been married and, according to their other four sisters, have failed to secure back their precious home Mannerling that was lost in a gambling match by their father who has since died. Abigail meets Lord Burfield who is back from the army and now in search of a wife. He finds Abigail intelligent and easy to talk with even in matters of politics, thanks to the efficient education from their governess, Mrs. Trumble. But the plot takes many twists and turns in this novel as Harry Devers (the villain from the previous novel) suffers an injury from a riding accident and circumstances have him recuperating in the Beverley home, where he catches the attention of sweet Rachel, the twin sister of Abigail. And another character, Prudence Makepeace has her eyes on Lord Burfield and wants him as a husband for herself. She will connive to get him to forget Abigail. So much plotting going on! In this story, we see a sister who is the feistiest heroine so far. Abigail has a temper and she is fearless sometimes, making her do foolish things. I loved this story because it made me laugh as the characters got into all sorts of mishaps. Chesney sure knows how the ton think and react in Regency England, and she creates situations that get solved in ways unexpected that made me want to cheer. Once again, I liked Mrs. Trumble’s character very much. Only a little more is disclosed about who she really is and I can’t wait to find out what her story is. She is definitely a woman ahead of her time, independent, intelligent and quick-witted. She understands the Beverley sisters and does everything in her power to help them forget Mannerling, their former home that now is also haunted because its previous owner committed suicide by hanging off the chandelier. 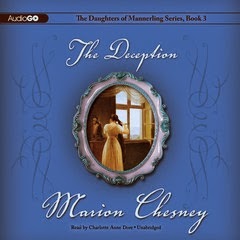 Charlotte Anne Dore, once again, does a great job with the narration. She brings the characters and the story to life. I have a weakness for British narrators, and I have grown fond of her narration. Up next is the fourth book in this series, and I eagerly await to see what else the Beverley sisters will get themselves embroiled with. So glad I started this series!